Described in a recent report as the “undisputed king” of the energy storage industry, California continues to blaze new trails, now with legislation to boost customer-sited energy storage. The California Senate recently passed SB 700, which creates incentives for customer-sited energy storage in homes, schools, farms and businesses. Next, the bill moves to the state Assembly. The 10-year rebate program, called the Energy Storage Initiative, provides up to $1.4 billion and lets the PUC set the total amount, said Laura Gray, energy storage policy advisor with the California Solar Energy Industries Association. It aims to make storage more accessible to consumers. 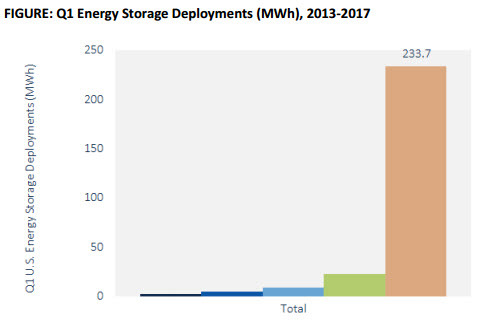 Separately, GTM Research and the Energy Storage Association (ESA) reported this week that California “will remain the undisputed king of the U.S. storage market over the next five years.” Arizona, Hawaii, Massachusetts, New York and Texas vie for second place. California helped drive what proved to be a record-breaking first quarter for energy storage in the United States. GTM and ESA’s latest “U.S. Energy Storage Monitor” reported that 234 MWh of energy storage was deployed, a 944 percent rise over the first quarter last year. Ravi Manghani, GTM Research’s director of energy storage, attributed the big leap in part to a large battery deployment made to bolster reliability following natural gas leaks at California’s Aliso Canyon. Several recent policy moves also boosted energy storage in California, according to the report, including a doubling of the Self-Generation Incentive Program in April, upping the program’s budget to $83 million annually for 2017-2019. Energy storage will get 85 percent of the funds. Of that 90 percent goes to projects larger than 10 kW and 10 percent to residential projects less than or equal to 10 kW. The California Public Utilities Commission announced an additional 500 MW of distributed energy targets for the three main investor-owned utilities, distributed evenly among the three. The California Independent System Operator released its Energy Storage and Distributed Energy Resources Phase 2 proposal, meant to lower barriers for energy storage and distributed energy to participate in the wholesale market. California topped all states for non-residential and utility energy storage installations in GTM’s ranking. For residential storage, however, the state ranked only third. Residential installment may increase if California lawmakers approve the customer-sited energy storage incentives. California sees economies of scale pushing prices down over time. So under SB 700, the rebates for customer-sited energy storage get smaller as more systems are installed. Bill sponsors hope the incentives will lead to more use of renewable energy and reductions in greenhouse gases. The electrical system is evolving…toward a model focused on local energy sources. What’s more, energy storage can help reduce line losses over long-distance transmission lines. And it can help customers be more actively involved in the electrical system, which helps them better understand the system. Energy storage also leverages private capital while insulating customers from increasing energy costs, the bill says. Rebates will go to customer-sited energy storage systems that the commission determines safely use the existing transmission and distribution system. Under the proposal, at least 30 percent of the amount collected will be reserved for energy storage systems in low-income residential housing and storage systems located in disadvantaged communities or low-income communities owned by small businesses, local or state government agencies, educational institutions or nonprofits. In addition, the CPUC will create a streamlined reservation process, giving preference to projects that are part of the Multifamily Affordable Housing Solar Roofs Program. While California has blazed the trail, it still has a long way to go in getting more energy storage on the ground, the bill says. “California is a worldwide leader in the development of energy storage systems and advanced management of the electrical grid, but the market is so small that this leadership position is not firm,” the bill notes. Indeed, neither California, nor the industry as a whole, should expect a repeat of the Q1’s spike any time soon. It’s likely something of an anomaly. “The industry shouldn’t get too comfortable, as with fulfilment of Aliso Canyon deployments, there aren’t that many 10+ megawatt-hour projects in the 2017 pipeline, indicating that the first quarter may be the largest quarter this year,” said GTM’s Manghani. While spikes may be rare, the energy storage industry is still poised for impressive long-term growth. GTM Research forecasts the U.S. annual market to reach 2.6 GW ( 7.2 GWh) by 2022, creating a $3.2 billion market, a tenfold increase from 2016 and a fivefold increase from this year.